Super Eagles forward Alex Iwobi had one of his best games for Arsenal as Unai Emery's side kept their hopes of a Champions League qualification alive with a nervy 2-1 win over Huddersfield Town at the John Smith's Stadium. Iwobi grabbed his third league goal of the season scoring in the 14th minute which ended a seven game streak without a goal. Izuchukwu Okosi monitored the ratings by the English press following Iwobi's heartwarming performance. Popular website Football.London which focuses on all the clubs based in the capital suggested that Nigerian did his chances of more game time some good. "Alex Iwobi: With so many senior attackers injured or working their way back to fitness this was Iwobi's chance to shine. He certainly did. "There might have been an element of fortune in his deflected volley for the opener but there was nothing lucky about the space the 22-year-old kept finding in midfield as he schemed and flitted elegantly around the game. "An exceptional display to prove the doubters wrong. 8." For 90min.com, Iwobi was the most outstanding player in the game with a near perfect score of 9/10. 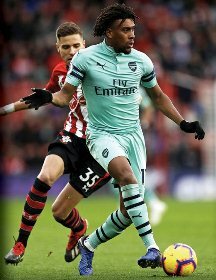 "STAR MAN - Alex Iwobi's fine form in recent weeks continued on Saturday as he put in a top display against the Terriers. "The Nigerian, as well as , caused the hosts all sorts of problems playing just off Alexandre Lacazette." Their glowing assessment of Iwobi was followed by readers' comments who concurred with the rating. Arsenal Station, a blog dedicated to the club paid glowing tribute to the Nigerian whom they acknowledged was the best Arsenal player on the day. "Iwobi. 8/10. Easily our best player. Scored the opener and almost had another in the second half. A constant threat going forward. Great to see." Pain in the Arsenal, another blog that reports about the club handed the Hale End Academy graduate a 7.4 out of 10. "A primary threat throughout the match. Loose with the ball an gave possession away more than I'd like, but at the end of the day, I'd rather that than him doing nothing. "His goal was well taken, even if it took a bit of luck. That said, no matter how well he plays, there is always that drawback, and his drawback was seen in the second half when, all of a sudden, the nerves kicked in. "He couldn't have looked more comfortable in the first half, but in the second, numerous times I was left scratching my head, wondering what he was thinking. "Good but not great. Could have had another two goals and two assists if he knew how to take his chances better." Iwobi is expected to play a huge role in Arsenal's Europa League Round of 32 clash against BATE Borisov next week Thursday.